Isabella had a full tummy after her first Thanksgiving feast. Turkey and bourbon, it’s a Kentucky tradition. Especially Wild Turkey 101 – just goes with Thanksgiving. But this year I’m trying to keep the trimmings to a minimum for my overall Thanksgiving experience. I’m in my 17th week of a weight loss program, where I’m looking to drop 30 pounds. So far I’m down 18 pounds. What I’m looking to do is survive a four-headed Thanksgiving attack; brunch with my folks, Thanksgiving dinner in Louisville with Maia’s clan, alternative Thanksgiving dinner with brother and my folks Friday, then double birthday party for Maia’s dad and Jacy Sunday. 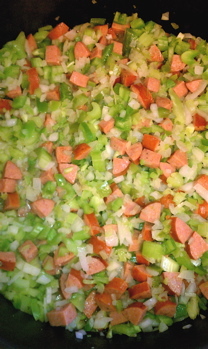 The “Holy Trinity” of green peppers, onions and celery sautéing with the butter and Andouille sausage. That is a bunch of family and a ton of food. Thanksgiving is not a holiday I take lightly. People can eat themselves into a coma that will stretch through Monday. That can’t happen. I have to step on a scale Monday to weigh-in. As luck would have it, Thursday is one of my days off, so I could chill guilt free and enjoy the holiday. I sampled a bit of everything, just didn’t go back for thirds or need a crane to carry my plate to the dinner table. I even had a couple mimosas at brunch, and two glasses of Makers Mark 46 with dinner. 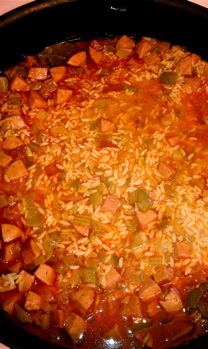 1/2 Cup Butter; 2 Pounds Chopped Andouille Sausage; 3 Cups Chopped Onion; 3 Cups Chopped Celery; 3 Cups Chopped Green Bell Pepper; 10 Cups Chicken Stock; 2 Bay Leaves; 1/4 Cup Worcestershire Sauce; 4 Tablespoons Frank’s Hot Sauce; 1 Teaspoon Ground Black Pepper; 1 Teaspoon Ground White Pepper; 1 Tablespoon Creole Seasoning; 4 Cups uncooked Long-grain White Rice. All the spices are in and rice is doing its magic. This dish can be a little hot but perfect for this time of year. In a Dutch oven or 3-quart saucepan, melt butter and brown Andouille; sauté onions, celery, and bell pepper for 10 minutes; then add chicken stock, bay leaves, Worcestershire sauce, hot sauce, pepper, and Creole seasoning. Bring to a boil for 10 minutes. Stir in the rice and bring to a second boil. Then remove the pot from the heat, cover with a tight-fitting lid, and let sit until the rice absorbs all the liquid, around 20-30 minutes. Remove the bay leaves and serve. This dish turned out great, as did all the food at both stops. Kudos to all the chefs and contributors. This was a very pleasant day. I have much to be thankful for. My immediate family and Maia’s are all with us and in reasonably good health, and it’s our baby Isabella’s first Thanksgiving. She had a wonderful time eating pumpkin pie, and took to ReddiWip like a duck to water. Still, the holidays remain bittersweet to me. There are people who used to be in my life that I cared for deeply who are not anymore, and I think about them often. Time supposedly heals all wounds, I guess we shall see. 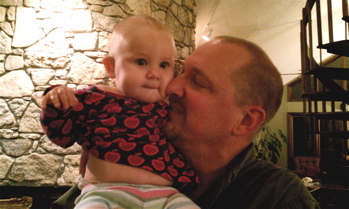 At the same time I have new family who are also old friends, along with my baby girl who is inspirational. I am fortunate. For the past year I’ve blogged a lot about the bigger issues that concern our society. America has never been more technologically savvy. Computers and smart phones have allowed people an unprecedented level of access to modern computerized luxury. The information super-highway is wide open and bustling, but internal squabbles are causing America to stumble. We are at an impasse socially. Partisan politics is crippling our country. We need jobs, educational funding, health care, a balanced budget, less debt, renewable energy, and a healthy respect for climate change. We can address all of these issues, but it requires putting aside personal agendas and not worrying so much about trying to legislate freedom of choice. A lot of people are suffering, and have been for years. Ask the folks on the East Coast who were impacted by Hurricane Sandy. I feel for them – they are on an early part of their recovery journey, that for many in New Orleans well realize, will likely take years to repair if ever. Partisan doesn’t fix what ails these people. My best wishes go out to them, especially the folks on Staten Island and Far Roackaway in Queens. We need to focus on our real problems, not periphery distractions. In the meantime I also want to thank the military, firemen, police officers, and first responders, who are out there every day keeping us all safe. These are hard jobs, and ones that keep these professionals away from their families – many times on holidays like today. So thank you to their families as well, and I hope they know how much we appreciate their sacrifices.